It's just a matter of time before Prof Mori develops superpowers because of the radioactive spiders. The danger is iminent and high. I was afraid this will be the begining, withs Spiders and Hornets and so on are all poluted. The insects are food to almoust anything and everything. And it all accumulates, the higher opp in that "chain", the bigger the doses are. And ther by the effect of it. We are indeed creatures of perseption and thats becomed a dangerous aspect. I am afraid people will not react before bigger creatures dies, and then Its to Late. If any person is in that envirioment, that person is in very dangrous suroundings. And bear in mind that this alters DNA and is already doing it. Thks again for translating this. Measuring insects is one interesting area, the measurement readings are quite straightforward. Comparing the readings to spider’s surroundings possibly much more challenging... absolute conclusions escape human capability? 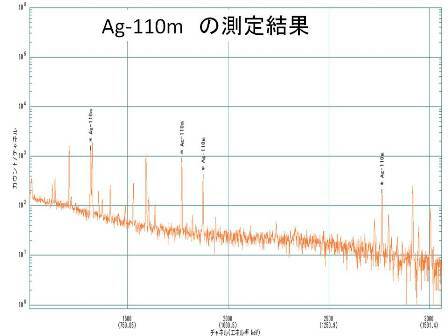 - If proportional concentrations vary, what is the Ag-110m diagram versus cesium diagram since the nuke xplosions? What is thei difference - if any? - What is the lifecycle of theses critters? - How old were these poor beasts, destroyed for the nuke science? Were they adults already 11.03.2011 or just eggs burrowing deep underground until August? - What is their day/night behavior meaning how are they spending their days, in a shield at night? - How do those issues correlate into the rad-clouds and their concentrations, wind directions? There is no end into those kind of 'stupid' questions which possibly turn conclusions upside down. The Chernobyl report you posted some time ago, has some related issues how these nuclei move in the nature, I hope Dr. Mori uses that wisdom in his conclusions. Maybe he means higher by one order of magnitude, ie. factor 10. I don't know much about radiation, but there were a few questions about the spiders, and I do know a bit about them. I don't have any experience with N. clavata, but I am familiar with other members of the genus, especially a very similar one on the southeast US, Nephila claviapes. Most of what I mention below is based on this species but I doubt N. clavata is very different. Spiders in the genus Nephila are orb weavers meaning they build the classic round webs we think of when we hear the phrase "spider web". 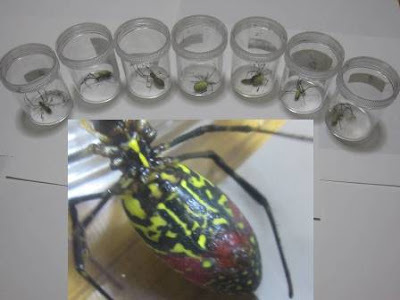 The common name for spiders in this genus is "golden silk orb weaver" because the silk has a distinctly golden color. They also are known for building very large webs, 8 feet (2.4 meters)or more across. The typical lifecycle of these spiders in temperate zones is that the females make an eggsac (possibly several) in the fall, each containing several hundred eggs. She usually dies sometime after that. The eggsacs are attached to plants or other structure near the web. Although the eggs may develop into spiderlings in the fall, they will not emerge from the sac until the spring. They will mature and grow rapidly over the summer, reproduce in the fall, lay eggs and die. So basically we're looking at a one-year life cycle, although species in warmer climates may live longer than this. So, these spiders probably are adults, and judging by the photos, most are females. Male Nephilas are very tiny in comparison and are often overlooked. If their seasonal habits are anything like their American relatives they have probably already mated. They feed on insect prey that the capture in their webs. Although they do not eat dirt (indeed they rarely leave their webs if they can help it) they may (like many other orb weavers) supplement their diet with airborne pollen that gets stuck in the web. It would seem possible that they could also ingest contaminated debris while consuming this? "(indeed they rarely leave their webs if they can help it)"
So there is one distinct difference with the earth rad samples; these ‘samples’ are mostly 'airborne' and further away from the ground, rainwater pools. I would guess these spiders stay out of rain. "supplement their diet with airborne pollen"
- Here rises a question how Ag-110m behaves versus cesium? If there was/is 'average' nuclear fallout cloud, does cesium wash down in the rain whilst Ag-110m floats? Or does pollen attract more Ag-110m than cesium? Whatever, the issue is very complex - more so as the molten reactors can continue burping openly unhindered. "...This is the first discovery in the world that an insect highly concentrates silver." This is perhaps the most significant discovery of the research work performed, because it is saying that silver is more significant to biological life than previously thought. No wonder there has been such an upsurge in silver being used as an anti-bacterial, anti-viral, and anti-fungal agent, and something that promotes healing of the body. Cancer Research in the UK has funded a research program to find out silver's effectiveness as an anti-cancer cell agent. It is unfortunate that silver concentration in insects had to be discovered this way, but perhaps this will lead to a better understanding and development of future treatment of diseases using silver. this will lead to a better understanding and development of future treatment of diseases using silver. LOL. Whata Fukulogic! Irradiated Disease Free Corpses; published papal goal is 6 billion. Keep Fuku Tri-logy Open! @Wade -- Thank you for taking the time to share your knowledge with the readers of this blog. "Incomprehensible diatribe against Russian Jesuits starting in 3...2...1"
He's only active on comment section in a.m., after that they put him back into his cell. "LOL. Whata Fukulogic! Irradiated Disease Free Corpses; published papal goal is 6 billion. Keep Fuku Tri-logy Open!" Perhaps some do not have the mental capacity to understand this, but the spider did not accumulate the silver because it was radioactive silver, but because it's silver. By the same token, radioactive iodine is absorbed by the thyroid because it is iodine, not because it's radioactive. So, stop posting this nonsense about 'Irradiated Disease Free Corpses'. If someone can't think outside the box, that's their own fault. Interesting about the healing properties of Silver. Found many years ago that it heals burns like magic. Hmmm...Maybe that's the reason they are injesting silver. And don't assume the silver is from the reactor. Everyone uses it for cloud seeding these days. But all very interesting nonetheless. Alas the troll cannot read. Even if it could, no way of understanding; all intellectual (?) action between legs... Who helps them write? 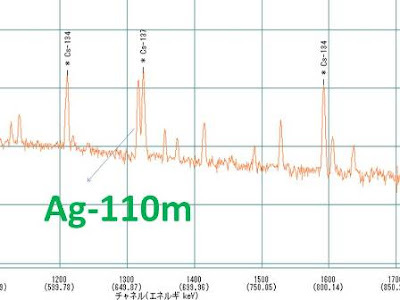 "When I identified this peak, it turned out to be one of the 4 gamma-ray peaks from Ag-110m (nuclear isomer of silver, half life 249.5 days)"
Anon 7:39, according to the Finnish-ed troll, everyone else is a troll and I'm surprised you didn't get called a Jesuit and/or a virus infected ant too. Of course spiders should not be up taking man-made radioactive silver instead of what silver they would naturally find in their environment but that they store any silver in measurable amounts is interesting and ought to be investigated, I agree. Thinking this does not conflict with worry over how radioactive silver will affect the spider. Hopefully, the spider is as tolerant to radioactivity as the cockroach--because, really, hope is all we and the spiders have left. LOL. Whatan idiotic trollore, so stupid that cant even be ashamed. I guess u lost your stipend. What does the Honey of Japan contain? 桁違い usually means an order of magnitude difference (factor of 10) in scientific Japanese.